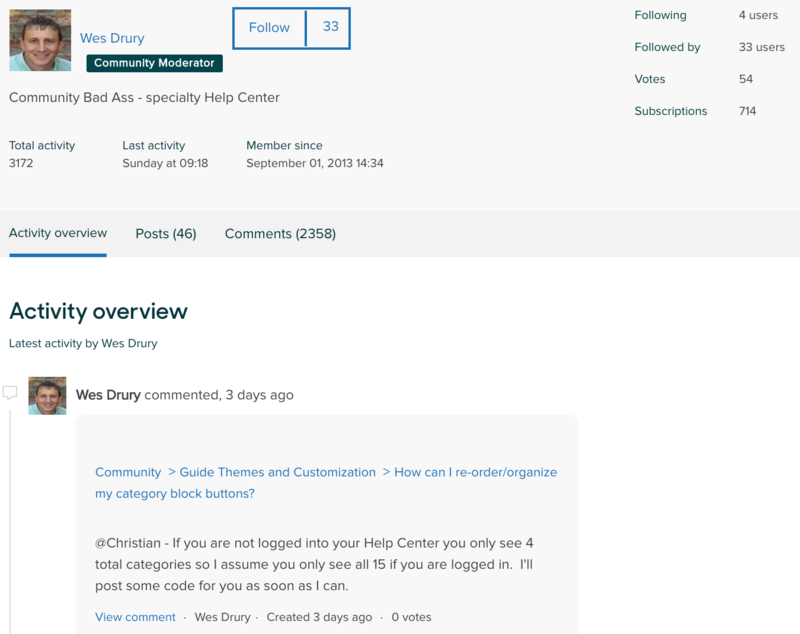 Help Center profiles display user information, activity, and recent contributions. Help Center profiles also enable users to follow one another and get notifications of new articles, posts, and comments for anyone they are following. Help Center profiles are enabled by default and are available even if you are not using Community in your Help Center. Help Center profiles are available on Guide Professional and Enterprise. Help Center profiles can be either public or private. Public profiles display user details contributions to everyone. Private profiles display user details to everyone, but show contributions to only the owner and agents. Public profiles become active and visible to all users when the user makes a public contribution, such as a post, community comment, or article comment. Until then, the profile is visible only to the owner and agents. Public profiles also include an overview of the user's last ten contributions, as well as access to all the user's articles, posts, and comments. If you are using a standard Help Center theme, Help Center profiles are enabled by default. You can enable or disable profiles as needed in Help Center settings. If you are using a custom Help Center theme you might need to add code to your custom theme before you can enable Help Center profiles (see Adding profiles to your custom Help Center theme). You can determine whether you want your Help Center profiles to be public, for everyone to see, or private, for only the owner and agents to see. Users cannot follow one another with private profiles. Note: If you are using SSO or the User API and have disabled the “Allow users to view and edit their profile data” setting in Zendesk Support, users will not be able to edit anything other than the description in their Help Center profile. Under Communities, select or deselect User profiles. If you are enabling Help Center profiles, decide whether you want Public user profiles, which are visible to everyone, or Private user profiles, which are visible to only the user it belongs to and agents. Is it possible to use Community and User profiles without using Zendesk Support (tickets)? Just to confirm you mean to use both in sending tickets? But you need to have at least 1 zendek support account (tickets) in order to use Guide. We are interested in using the Community in the Zendesk Guide, but we do not want to use Zendesk Support (Tickets), and I have doubts as to whether it's possible to have one without the other. We have enabled profiles in our Help Center, but I can't figure out how our customers can find the profile for other users. It looks like the only way they can do this is to find something the user has posted and click on their name. Is there a way that our customers can search for other customers in order to access their profile? Thanks! At the moment Help Center search only applies to actual content, not users. I did find a post about this functionality in our Product Feedback topic here; I'd encourage you to add your detailed use case to this thread to ensure our Product Managers see it! Thanks for the update. I will find that product feedback post and update it with our use case. Hi, does anyone know what exactly the following option does in terms of notifications etc.? Do they get an email every time the person they are following posts or comments? Is it possible to display a custom user profile field value next to the user name in a community topic? For example, we would like to identify which office number a user that posts in the community is from. Only work around I can think of would be to append this info to the user's name. You are correct and the easiest solution here is to include the info in the users name on their profile page. Otherwise you're looking at implementing some custom code within your Guide theme. It may also be worth taking a look at our Adding agent badge in Communities as that can give you a good idea of what sort of changes you'd need to make in your Help Center.